The performance of Handel's Israel in Egypt in King's College Chapel on 19 April was the part of the 2014 Easter Festival at King's College, Cambridge. The choir of King's College Chapel and the Academy of Ancient Music were conducted by Stephen Cleobury, with soloists Clare Debono, Katherine Watson, Robin Blaze, Thomas Hobbs, Edward Grint, and James Oldfield. They performed the traditional version of Israel in Egpyt in two acts, based on Handel's own 1756 performances of the work. The original Israel in Egpyt, in three act, was premiered in 1739 and Handel had included a revised version of his funeral anthem for Queen Caroline The Ways of Zion do Mourn. This grafting did not seem to take and Handel's subsequent revivals were all variations on the two act theme. For some reason the standard vocal Novello vocal score for the oratorio (in two acts) includes no overture. On disc, conductors often choose to add one which makes for a satisfying start. Stephen Cleobury chose not to, so that we launched straight into a vivid recitative from Thomas Hobbs. The choir of King's College Chapel numbered some 18 trebles and 15 singing men (four altos, five tenors, six basses). I can imagine few choirs of men and boys or such a size who would dare to perform a work like Israel in Egpyt. It is very much a choral tour-de force with 20 choruses, some for double choir. 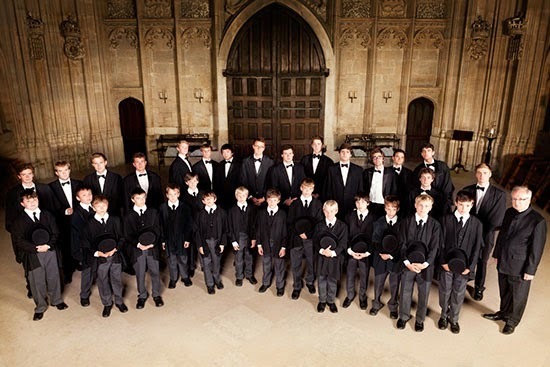 And it is worth bearing in mind that not only are the trebles as young as 8 but that the singing men are all choral scholars which means that they too are relatively young for their voice types. Part one of the work has only one solo, the vivid description of the land bringing forth frogs, sung with bright, soft grained tone by Robin Blaze, with a good attention to the words. The remainder of this part is devoted to the chorus, with a remarkable sequence of descriptions of the various plagues inflicted by Moses on the Egyptians. It is rare to hear a Handel oratorio sung with boys on the top line, and the famous King's College sound brought a transparency to the whole performance. The generous acoustic was not one for which the work was designed (Handel premiered it in a theatre), and the choir worked very hard to get the words over with some wonderfully spat out consonants. They made a good strong focused sound, nicely blended with a transparent top. The singers were clearly relishing Handel's vivid depictions of the different plagues, and though the music is technically demanding the singers were apparently enjoying themselves. So we had evocative darkness, thrilling hailstones and an impressive intensity and strength in the smiting of the first born, culminating in a vividly robust final chorus. Part two is more varied and introduced the other soloists. Clare Debono and Katherine Watson made a lovely balanced pairing in the soprano duet The Lord is my strength and my song, a lovely intertwining of two complementary and contrasting voices. And Edward Grint and James Oldfield were nicely vibrant in The Lord is a man of war. Thomas Hobbs brought excitement and vibrancy to The enemy said, I will pursue. Clare Debono was technically assured in Thou didst blow with the wind though I thought her tone a little to emphatic and edgy. Robin Blaze brought his familiar sweet tone and intelligent musicality to bear on Thou shalt bring themin. The chorus were on fine form in part two, though their role had less narrative description. But they brilliantly brought off such dramaturgically complex choruses as And with the blast of Thy nostrils the water were gathered together, and combined gripping drama with soft-grained tone in The people shall hear. It was clear that towards the end the boys were tiring but the performance throughout was vividly expressive and quite a technical tour de force. The Academy of Music provided fine support with some nicely characterful playing. The organ used was the standard portative organ used by the Academy of Ancient Music, and I did rather think it a shame that some way could not have been found to use chapel's own organ. Stephen Cleobury showed himself well able to get a strong performance from his young singers, and with finely judged tempos which worked well in the acoustic whilst keeping thrilling virtuosity of Handel's oratorio.